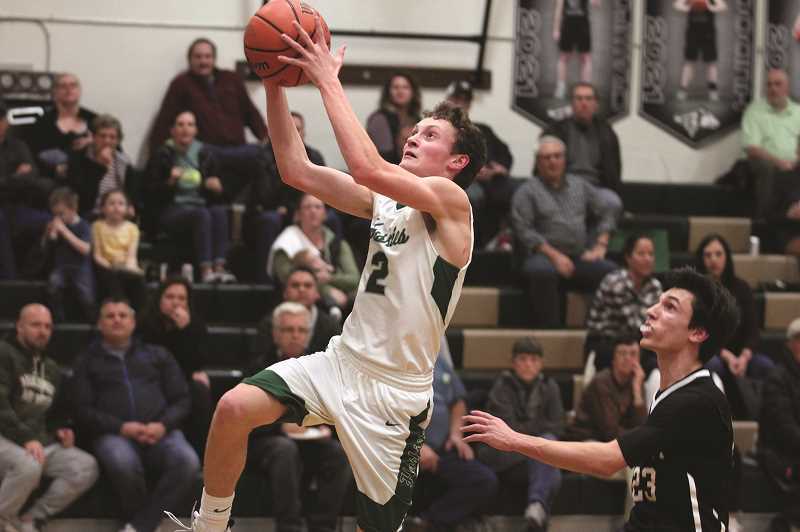 North Marion senior Jared Hauser has made plenty of shots in his high school career, but few as big as his final bucket against the Corbett Cardinals on Tuesday night at North Marion High School. Down 57-56 with 12.3 seconds left in the game, Hauser took a pass under the basket from teammate Sergio Jimenez, absorbed contact and threw up a shot behind his back. 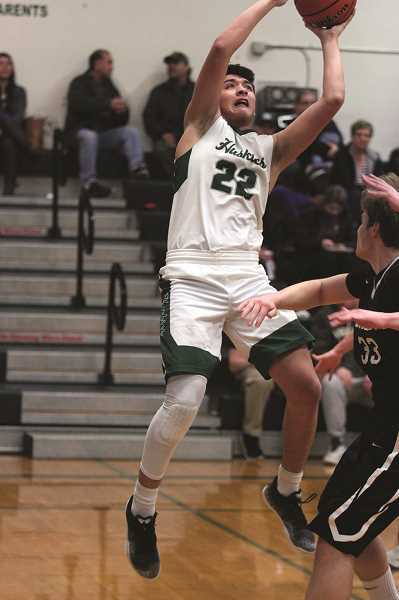 The ball swished through the hoop, and Hauser hit the ensuing free throw to give the Huskies a 59-57 victory over the Cardinals. "I saw Serge driving left and get stopped by two guys there and saw my guy overcommit, so I back cut and Serge gave me a perfect pass," Hauser said. "I went up like I usually do, try to fight through the contact and it went in." 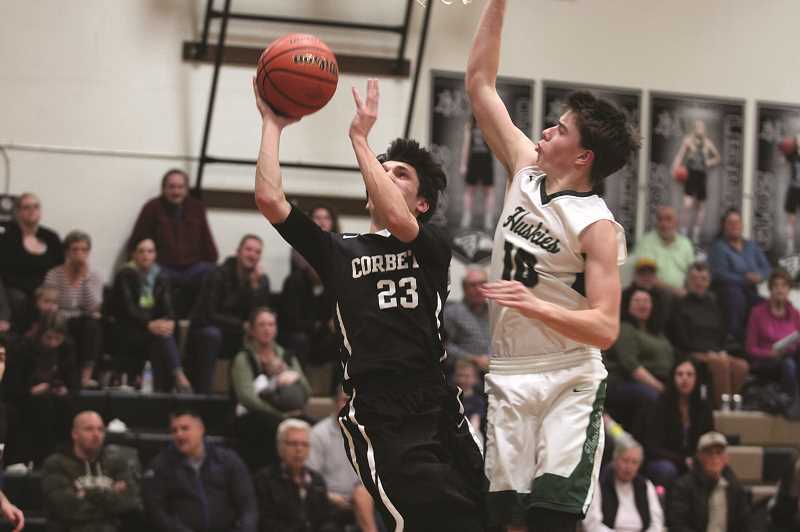 It was an unexpectedly close outcome between the two Tri-Valley Conference opponents, considering Corbett came into the game missing three starters and its top reserve due to flu-like symptoms. 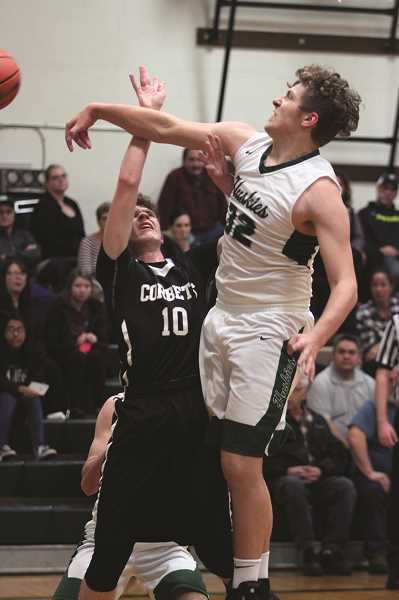 The Cardinals were expecting to take advantage of their superior size, but with most of their big men at home, head coach Don Carter was forced to lean heavily on senior guard Dylan Paintner while counting on big minutes from reserves like Mason Wright and Jake Newton, along with rarely-used players like Isaac Dennerline and Nathan Ronfeld. "I told the guys in the locker room there's nothing to be ashamed about," Carter said. "We gave them everything we had, playing in a hostile gym with refs that are friendly to the home team and we still had a chance to win the game at the free throw line." North Marion went into the final two minutes trailing by two after Wright hit one of two free throws to put the Cardinals up 56-54. Hauser missed a 3-pointer on the ensuing possession, but Corbett coughed the ball out of bounds with 1:10 left, giving the Huskies another chance to tie the game or take the lead. Jimenez responded with a driving layup to make it 56-56, but on the next play, Wright was fouled on a put back attempt, sending North Marion senior Brady Hansen to the bench with his fifth foul. Wright made one of two again to put his team back on top with 40 seconds left. The Huskies missed opportunities on their next two shots, first a 3-pointer from Grant Henry and then a layup attempt by Jimenez after a jump ball. Wright pulled down the board and was immediately fouled by North Marion, sending him to the line with 20 seconds remaining. The Corbett post missed both free throws, and Jimenez grabbed the rebound, leading to Hauser's game-winning shot. 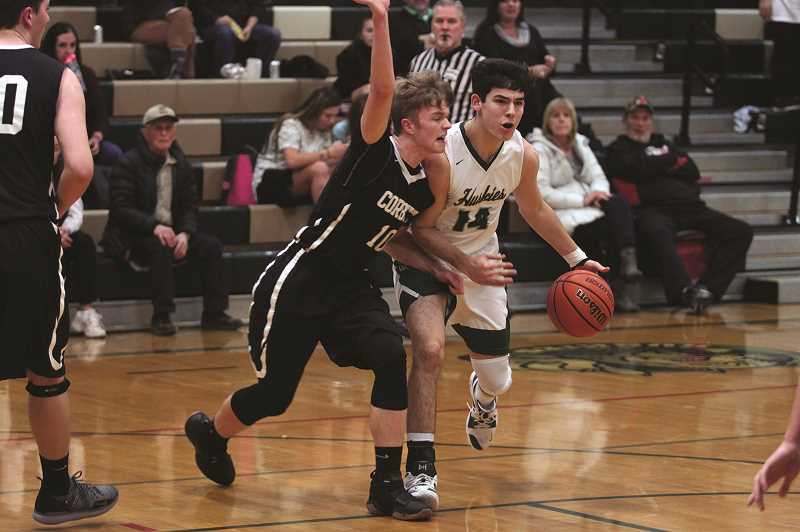 "We came out real slow and we talked about it at halftime how we need to get to the line more and put up the shots that we usually hit," Hauser said. "They just weren't falling, but in the huddle the talk was to just keeping going, keep going, keep going." The Cardinals had one last possession to win the game, but North Marion's defense kept Corbett from getting a good look, and Carter called timeout with 1.9 seconds left. Paintner got tapped for the game-winner, but the senior's shot from deep fell short of the basket as time expired. Paintner finished with a team-best 19 points, including seven in the fourth quarter when his constant drives to the basket put the Huskies in the penalty early. But the Cardinals were unable to take advantage, going just 4-of-10 from the free throw line down the stretch. "I told them tomorrow at practice, I bet they're going to pay a little more attention to their free throws," Carter said. North Marion was led by Jimenez, who scored a game-high 24 points, 12 of which came in the second quarter. Hauser was the only other North Marion player in double digits with 16 points, including three 3-pointers. Corbett spread the offense around, getting 10 points from Ronfeld and eight each from Wright and Josh Newton. Jake Newton had seven as well. With the first round of league play in the books, the Huskies (10-9, 4-1 Tri-Valley) sit just a game behind No. 8 Gladstone (14-5, 5-0) in the league standings, while the Cardinals (8-10, 2-3) are in a three-way tie for third. North Marion hosts Molalla (1-16, 0-5) on Friday at 7 p.m.
Corbett hosts Madras (7-12, 2-3) on Friday at 7 p.m. as well.